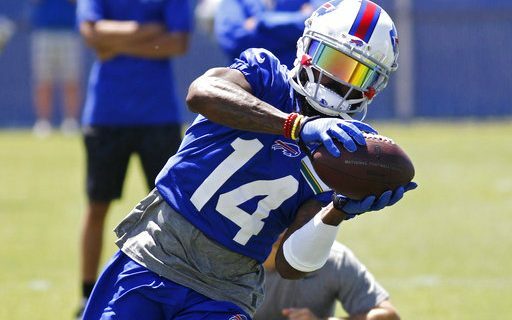 If there is a position that has a lot of question marks for the Buffalo Bills as they prepare for their 2018 training camp, it’s the wide receiver group. Last year the Bills traded away their top receiver when they shipped Sammy Watkins off to the Los Angeles Rams. In another trade the Bills acquired Jordan Matthews from the Philadelphia Eagles but Mathews did not play as hoped, with only 25 catches on the year and the Bills let him leave via free agency. In yet another trade near the trade deadline the Bills acquired former first round pick Kelvin Benjamin from the Carolina Panthers. Benjamin had some moments with the Bills but because of injuries, he didn’t play as well as hoped. Still, going into training camp he is the Bills top wide receiver. Benjamin has had some strong seasons in the NFL with 72 and 63 receptions respectively his first two years in the League. The Bills hope he reverts to that form in 2018. If OTA’s are an indication, that well could happen. Benjamin is not a “home run” threat but rather a consistent short to mid-range receiver who can create mismatches because of his size and athleticism. That type of receiver can get a high number of opportunities in the Bills offense. If healthy, Benjamin should be the Bills top receiver. Who plays across from Benjamin is unknown at this time and will be sorted out during camp. The player the Bills would like to see take control of the position is 2017 second round pick Zay Jones. Like many rookie receivers who come from college spread offenses, Jones struggled as a rookie. He also had an off field situation following the season that raises concern for the Bills front office. Still, the talent is there and if he progresses as hoped, he can help. He has the physical traits to become a very good NFL receiver. The slot receiver should be Jeremy Kerley. Kerley is new to the Bills but not the NFL. The eight year vet has had some very good seasons in the League. He had 56 and 43 catches respectively in 2012 and 2013 when he was with the New York Jets. He also had a 64 catch season in San Francisco in 2016. The talent is there, its just a matter of being in the right offense that can utilize his traits. Kerley has speed and quickness and is good at uncovering versus man or zone. After that trio it remains to be seen who will be in the final roster. Brandon Reilly, who was a undrafted free agent a year ago and looked good before getting injured, had a strong off-season. So did former Raider Rod Streater. Streater has put up some impressive numbers early in his career. Kaelin Clay, who was with Buffalo early last year before going to Carolina, was brought back and flashed during the off-season program. He isn’t better than probably a fourth receiver but he has special teams and return value. Quan Bray also has return value. Andre Holmes is another special teams guy who has excellent size and speed. The Bills drafted two receivers late and neither is a sure shot to make the final roster. North Carolina’s Austin Proehl is the son of Ricky Proehl and a similar type player. Proehl reportedly ran in the low 4.4’s at a regional Combine but he doesn’t play anywhere close to that speed. Ray-Ray McCloud has speed and can return kicks. As compared to the wide receiver groups of other clubs, the Bills have to be looked at as having one of the weaker groups in the League on paper. That said, there is talent in this group that just needs to be developed. We’ll start to find out in another five weeks when camp opens. Greg Gabriel on the Bills offensive line & defensive line.